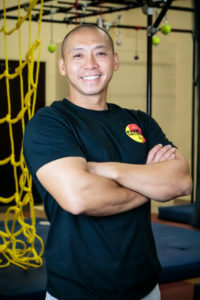 My name is Dominic Pham, owner of Phamily Fun & Fitness. My background revolves around sports, physical training, and martial arts. As a certified personal trainer for several years, I have enjoyed seeing the transformation in others and I continually strive to encourage others to follow their dreams no matter the cost. I have made three attempts to get on the American Ninja Warrior show but the closest I have come is being a tester for the obstacles. Many watch the show and would like to attempt the obstacles; some may have the strength yet don’t have the time to wait weeks on end in the walk-on line. Children who don’t meet the age requirement for the show may want to try out their ninja skills. Bottom line is I want to bring a ninja type obstacle course facility to bring out the best in Oklahoma, and share the course so others can be happy and fit. We believe in having fun and staying fit! Our facility provides children and adults an opportunity to attempt and accomplish our obstacle courses as individuals and as a team. Our obstacles, training courses, and rock climbing walls (coming soon) provide all ages young and old to have fun and find exercising exciting! If you want to improve your physical stature, build self-confidence, and have fun, come down and attempt the unknown. We look forward to getting fit with you! Give us a call today and come train like a Ninja! Come test your ninja skills out at our gym! We welcome both adults and kids, because let's face it...we can all enjoy fitness and fun together. Shoot us a note or give us a call at 405.285.5688. We will be happy to answer any question you might have.